Installing a new telephone jack, as shown in Figure 1, in your home is not a complex project. The greatest amount of difficult is to get the cable from any currently live telephone jack or open piece of wire to the location of the new telephone jack. The method of getting from point A to B is purely arbitrary and it is not necessary to take the shortest route, of cable length. It is usually wiser to take the easiest route, even if it uses twice as much cable. Telephone cable is relatively inexpensive. Although there are hundreds of manufacturers of telephone jacks, they all make a similar product, because of standardization of physical size and the telephone jack connection itself. Wall mount telephone jacks are available in a vast assortment of colors and configurations, where you can have 1, 2 (Figure 2) or even 6 jacks on a single wall plate. Even with these multiple jacks, the wiring remains constant. Each jack has 4 wires that are connected to it. There will be 4 screws on the back of the plate which are usually identified by a number or a letter, as shown in Figure 3. 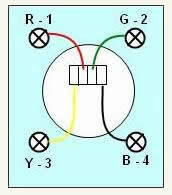 Most residential telephone cable has 4 wires, as shown in Figure 4, even though the telephone only requires 2 wires to operate, for each outside telephone line, originally the other 2 wires were installed in case of damage to the first two. Now the second set of wires is being used to deliver power to a second telephone line for either voice or fax operation. Note: The standard telephone cable wire colors of red, yellow, black and green. 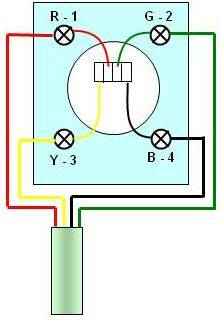 An operating telephone jack will have at least one cable connected to it, as shown in Figure 5. Unlike electrical receptacles where only one wire can be connected to any individual terminal, in a telephone jack there is no limit, based on safety or electrical operation. However, the length of the terminal screw does make it difficult to attach more than 3 wires in most cases. If there are two cables connected to the telephone jack the wiring will look like like Figure 6. In newer homes the telephone cable colors may be somewhat different. Red = Blue / White; Green = White / Blue; Yellow = Orange / White and Black = White / Orange, all as shown in Figure 7. If you cannot access a telephone jack in order to connect a cable, but you have access to a telephone wire, you can splice into the telephone wire in order to connect the new telephone jack. As telephones are very low power devices you are allowed to make splices without using electrical boxes and as well, you can bury splices in walls and ceilings. I do not recommend burying splices for telephone or any other low voltage device. Although it is not a safety concern, splices are a common trouble spot. Once buried you can never implement a fix to that splice. If you are going to splice into a telephone cable it is important that you make the wire connection properly. DO NOT use standard electrical wire nuts for telephone cable, you will have no end of problems with the connections. 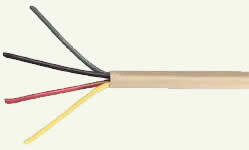 Use telephone cable splice connectors , as shown in Figure 8. These splicing devices have been created to join telephone wire. They utilize a pressure crimping mechanism that will last for decades.